The days may be getting shorter, the leaves on the trees getting browner, the weather getting colder. 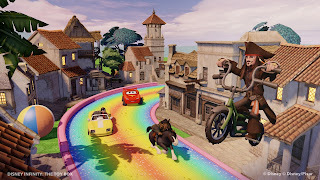 As the sun sets on those summer days and the children and parents of the world begin to settle back into that school routine, Disney Interactive have a solution that will both keep you happy throughout the autumn and provide such a heart warming experience that you won’t even notice those colder days. We’ve played the game, and created this review for you. It’s not the cheapest game you’re ever going to buy; in fact the high cost of the starter kit we imagine may be the big turn off for consumers. But for that £50-ish you’re getting three high quality Disney figurines (Captain Jack Sparrow, Sulley and Mr. Incredible), the figures are of a good quality and are very well presented. We certainly see these becoming the next big Disney collectibles. You’ll also get the Disney Infinity base, which is this plastic piece, again feeling of a good quality, that will plug into your games console with two circular squares and one hexagonal square, these are to place the various Disney Infinity pieces (more on that later) which you receive in the starter pack and then can keep on buying. You’ll receive one power disc at random amongst the Series One collection (more on what these do later) and obviously the game itself. One thing that we found very nice is the inclusion of a web code meaning we can link our figures to our Disney Account and then play with them on the upcoming iPad and PC versions of the Toy Box. The game begins by us discovering what a spark of imagination can do, visiting Disney Worlds far and wide and generally bringing a huge grin to our face as we discovered which of our favorite Disney characters will eventually be in the game, before revealing a big surprise and putting you straight into the much talked about ‘Toy Box’ mode of the game. The controls seem logical and similar to most video games we have played and so very easy to pick up, one thing that surprised us, in the best possible way, is how different each character feels to play. Sulley, for example, is quite a heavy feeling character and lacks perhaps the fluidity of movement that you’ll find in Jack Sparrow, just a small thing but makes each figure unique and more realistic. Play sets are a huge draw to the game, and in fact you might find yourself a bit limited to the flagship Toy Box mode until you’ve at least played a bit of them. If you enjoy film video game tie ins, this really will be familiar territory for you and you’ll certainly be in a familiar world in which you’ll enjoy all the riches of the Disney characters in their natural setting. If, however, you don’t enjoy film video game tie-ins, don’t worry, this is still for you. We’re not a huge fan of film games, however we got hours of enjoyment, the missions clearly had a big fun emphasis on them as we explored the large open worlds of the films, so if you are playing as Mr. Incredible, get ready to play in Megapolis, Sulley will roam the Monsters World and Captain Jack will be setting sail on the Caribbean seas. With the starter pack you’ll get Monsters University, The Incredibles and Pirates of the Caribbean play sets, with Cars and The Lone Ranger sold separately and a Toy Story in Space playset on the way this Autumn. The sets sold separately also include two figures in order to play the sets with a friend. 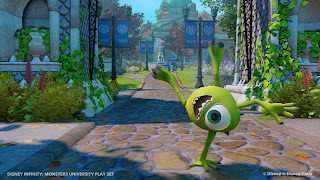 And there lies the biggest problem with the starter pack, if you want to play these Play sets in a co-operative mode, you need to have two characters from the world in which you are playing with, so don’t expect to be seeing Captain Jack Sparrow studying at Monsters University any time soon. Unfortunately this means you’ll need to be spending another £12 if you want to be doing co-operative with a friend from day 1, however you can build a Megapolis in Toy Box mode and have Sulley wandering the streets if you really want that. We’ve played the entirety of the Incredibles and Montsters University sets, and a good portion of the Pirates set, we noticed that each set had a different dynamic to it. So if you play the Incredibles set, you’ll be in a town that is being threatened by Syndrome. If you are playing the Monsters University set you’ll explore the Monsters University and Fear Tech campuses and ‘Fraternity Row’. The Pirates playset will see you sailing the seas jumping from island to island completing quests before Davy Jones beats you to it. Each set offers you around 4-6 hours of game play including all the challenges, races and collectibles. In your starter kit you’ll get around 16 hours of game play from the play sets, which for what is the smaller part of the game is quite a good amount of time. Our only problem is the voice acting is terrible in the most part. From what we have seen the voice for Mickey, Jack Skellington and Mike Wazoski are possibly the best voices in the game, the worst being Captain Jack Sparrow and Sulley. Overall, the playsets will offer you hours of fun and are probably worth the starter kit price alone. This is the major selling point of the game and has been advertised as allowing us to create ‘infinite possibilities’. But is this true? From the outset, not really. If you want to jump in and create impressive creations instantly, you’ll be disappointed. The game requires you to unlock items through the play sets, chests and something called the ‘Disney Infinity Vault’ (essentially a slot machine type thing where we spend our ‘spins’ and hope we get a good item for our toy box). 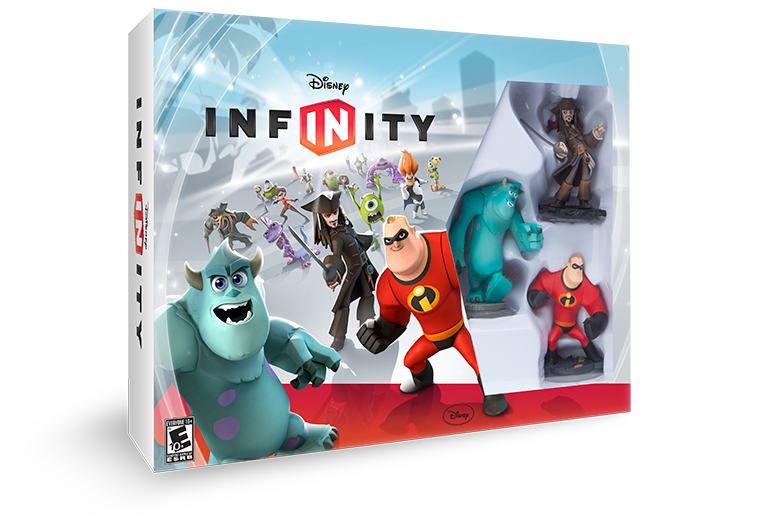 However, once you’ve started unlocking the items, we begin to see that we can do an awful lot with the tools provided without putting any extra money in, to vary up your created worlds Disney Interactive have released packs of ‘Power Discs’ in which you may receive a new world or objects. We got the Alice in Wonderland Tugley Wood disc in our first pack and were very impressed with how it altered the feel of our created world. A limiting factor is that there isn’t an ‘infinite’ amount of objects allowed in your world, the game will stop you once you’ve hit a quota of objects and this quota is not especially big at all; now this could either be a good thing in the way that you may feel the need to be more creative with your world, or (as in our case) frustrates you as you can’t create a huge world with hundreds of objects. We created a reasonably simple labyrinth and almost filled our quota with perhaps a couple of hundred objects. But, we also managed to create a fantastic Incredibles style world using the tools with a few twists. If you aren’t feeling creative, Disney will be releasing toy boxes each week that either they have made, or have been submitted to them. These worlds are fantastically detailed and may even include Toy Box pieces you either haven’t unlocked or bought meaning they are an ideal way to use these items or get an idea of what is to come in the game. This mode is perfect for multi-player action; you can create a Disney world, add a few random figures in and power discs and just sit back and have a lot of fun. We can see kids across the world playing this with friends after school with Sulley and Jack Sparrow with Toy Story guns and Mickey Mouse cars having a great time and adults playing once the kids have had a ‘early night’, and that is perhaps the ultimate compliment to the game. It’s hard to review a mode that allows you to do whatever you want as it really is subjective as to what you imagination leads you to do, and through that exploration you may find limitations, or perhaps you may not. And there lies the beauty of Disney Infinity, you can do whatever you want and allow your imagination to run wild. 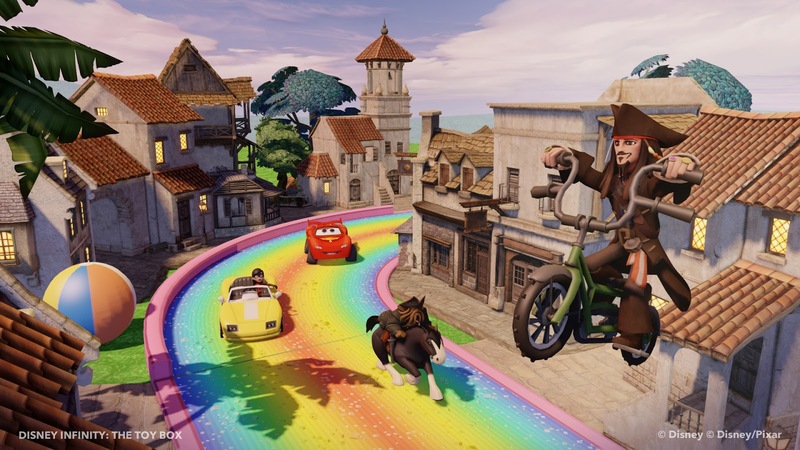 Disney Infinity is a fun game with multiple modes, each will have its fans but it’s the mixture of the two that create the game, in a sense this is two separate games and each of them great fun. But more than fun, there is a basic educational element to the games as children (and adults) will learn the basics of computer programming through ‘creativi-toys’. The co-operative elements and power discs will ensure that Disney have a revenue stream coming in from this game for a fair while, and there in lies it’s possible downfall with parents. This game is going to cost you a lot of money if you want all the figures, at least they are being released in waves. (Wave 2 will of course be in stores before Christmas). We think you’ll get hundreds of hours out of this game, and so we don’t hesitate to recommend it to you, make sure you tell us on twitter (@dlptownsquare) and in the comments below about what you have created, and your thoughts on the game.